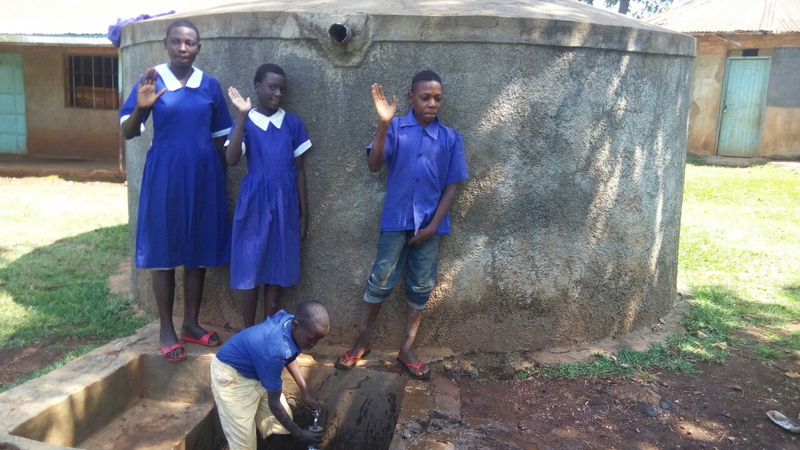 We are happy our pupils no longer carry water from their homes to school as it was before. They are now accessing safe, clean drinking water which can also be used for cleaning on a regular basis. A year ago, generous donors helped build a rainwater catchment tank and latrines for the Rosterman Primary School in Western Kenya. Because of these gifts and the contributions of our monthly donors, partners are able to visit project sites throughout the year, strengthening relationships with schools and communities, and evaluating the actual water project. These consistent visits allow us to learn vital lessons and hear amazing stories – we’re excited to share this one from our partner, Catherine Chepkemoi, with you. As Catherine made her way to Rosterman Primary to hold this interview, she thought back to her first visit to the school. 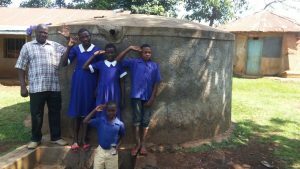 She remembered the hundreds of yellow jerrycans sitting outside the classrooms, which were used to tote water to school every day. This visit, those jerrycans were nowhere to be seen; instead, students were fetching water from their water tank. Students no longer have to worry about fetching water for class, since they have enough clean drinking water on school grounds. Catherine also noticed how much cleaner the school compound is. 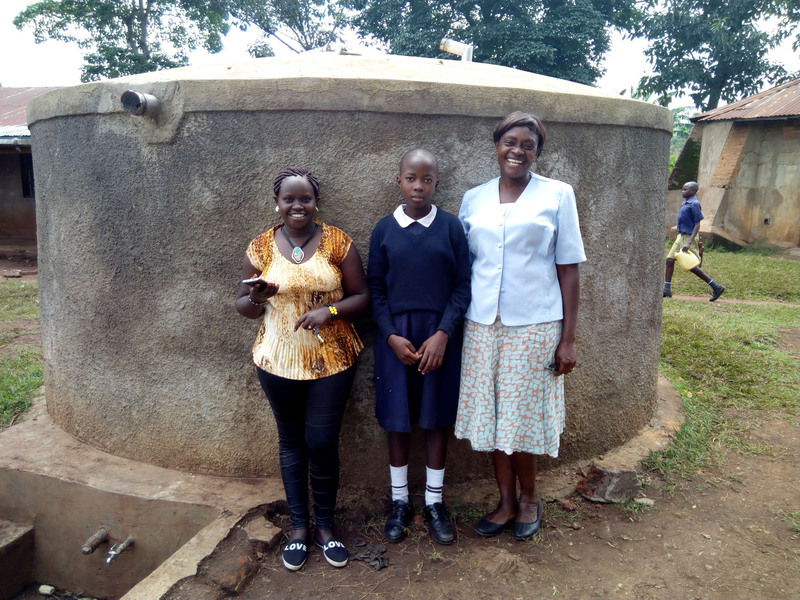 After talking to one of the teachers, she learned that classrooms and latrines are now mopped with water from the tank on a daily basis. Program Coordinator Catherine, student Bedline, and her teacher Mrs. Nzavaye. Catherine says that both Teacher Nzavaye and Bedline are representative of the rest of students and staff; everyone is so happy about this project. They have not remained the same thanks to clean water access, and are dreaming about other ways they can improve their school. They plan to start a lunch program soon! When you invest in The Water Project, you're investing in people like Bedline Atieli. Your gifts help us reach more communities with the gift of clean, safe water. And every drop helps unlock potential.